August dairy prices were announced September 3. All the important pricing numbers were up. First, all the good news will be analyzed and then some caution flags will be raised. Cheese prices have returned to the highest levels since November, 2008. 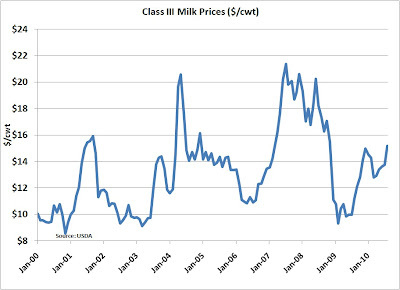 Cheese prices drive the Class III milk price, so it is up about the same. 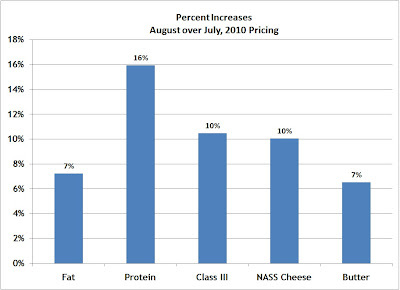 Cheese prices are also the main driver of protein prices, so they too benefit. Cheese prices are showing exceptional strength. 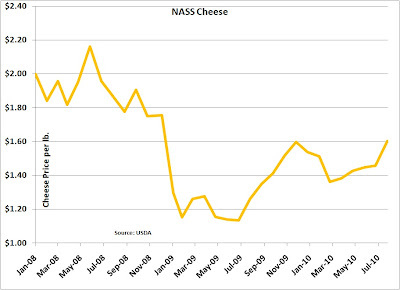 Cheese prices on the CME, which leads the NASS pricing by about 2 weeks, are currently averaging around $1.70 per lb. This is $.10 above the August NASS price for cheese, so there is good reason to expect further NASS price increases in September. 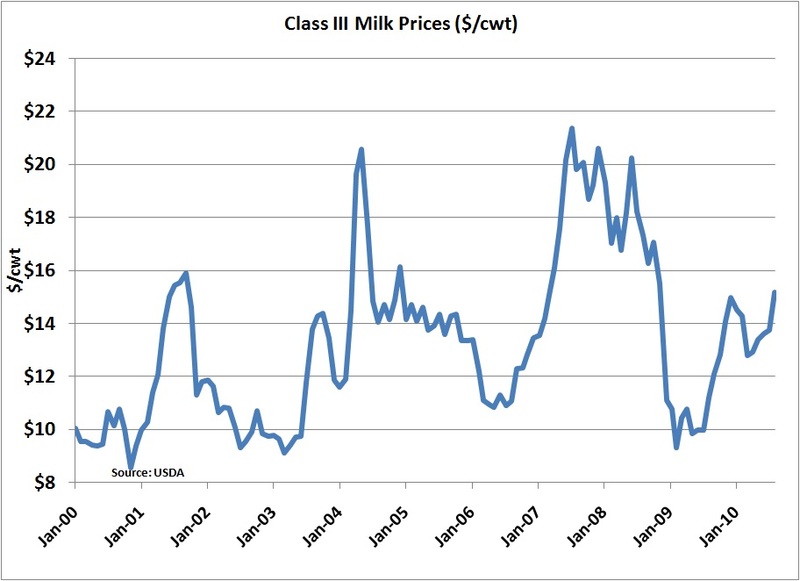 To gain perspective on Class III milk prices, the chart below shows that while these prices have not hit the highs of 2008, they have recovered significantly from the lows of 2009. 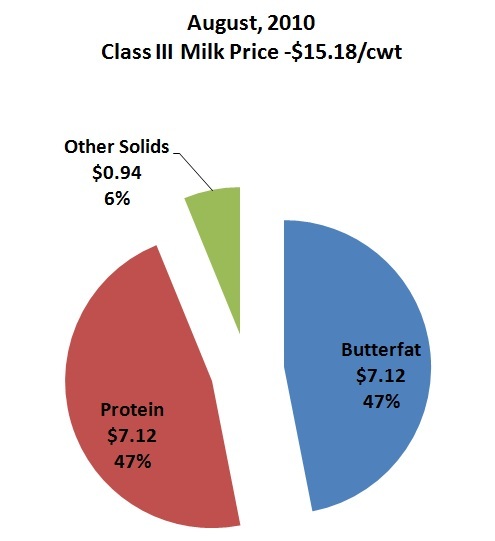 Butter prices were also up very significantly, hitting $1.85 per lb for August. 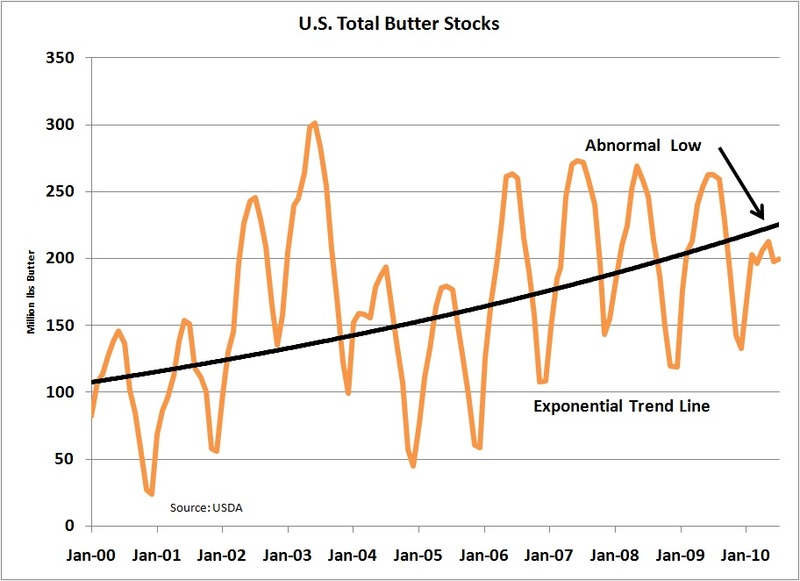 Butter has not seen prices this high since 2004. Although butter prices do not have much of an impact on Class III milk prices, they do have an impact on butterfat prices. 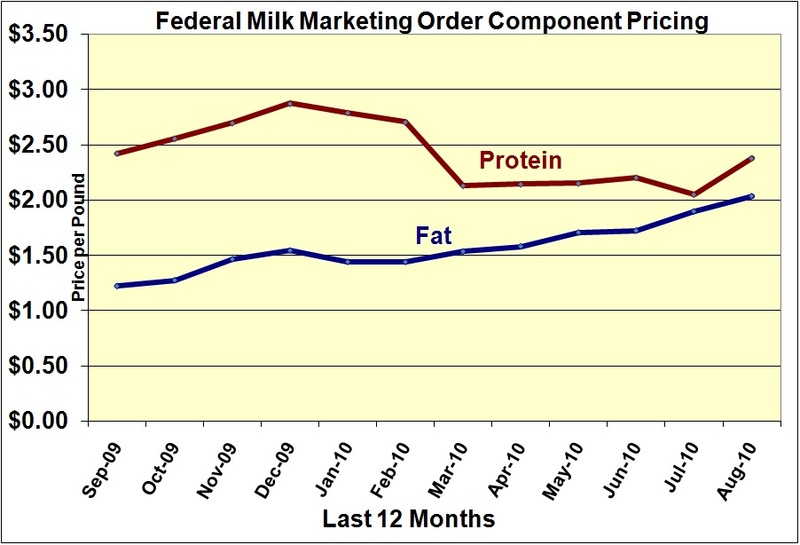 These changes have brought the relative values of milk protein and milk fat back to a more normal balance. 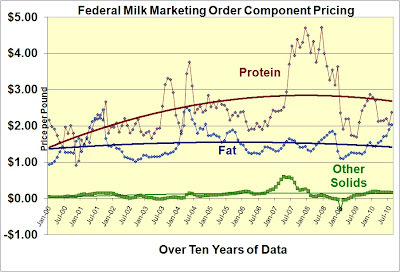 The chart below shows the prices since January, 2000 when the current component system was implemented. 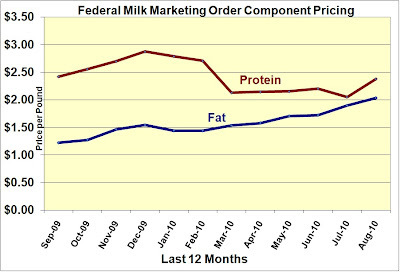 The last 12 months can better show how the spread between fat and protein has again increased. 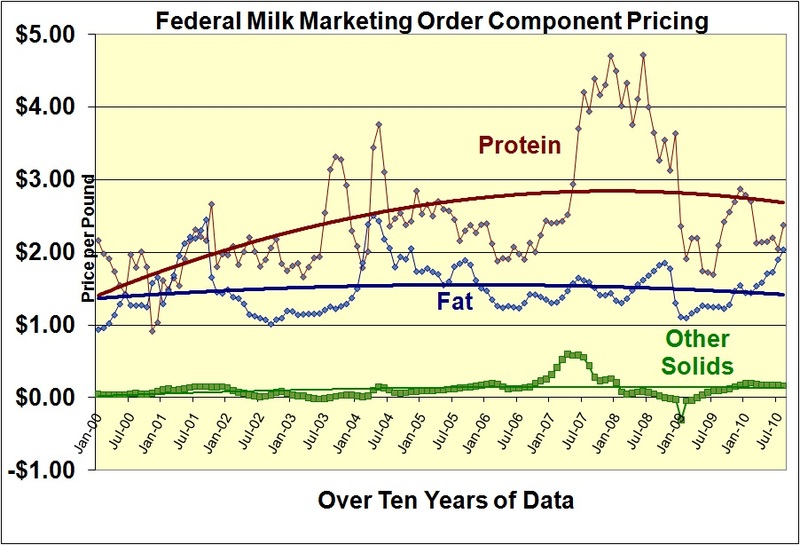 This has brought the pie chart of Class III milk expenditures into balance with an even spread between compensation for fat and protein. However, there are some signs of caution. 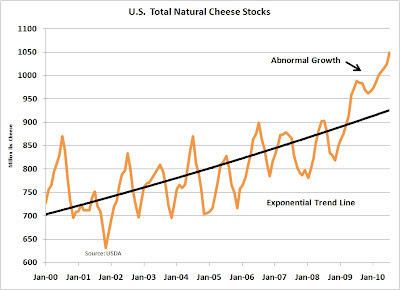 Cheese inventories remain very high. 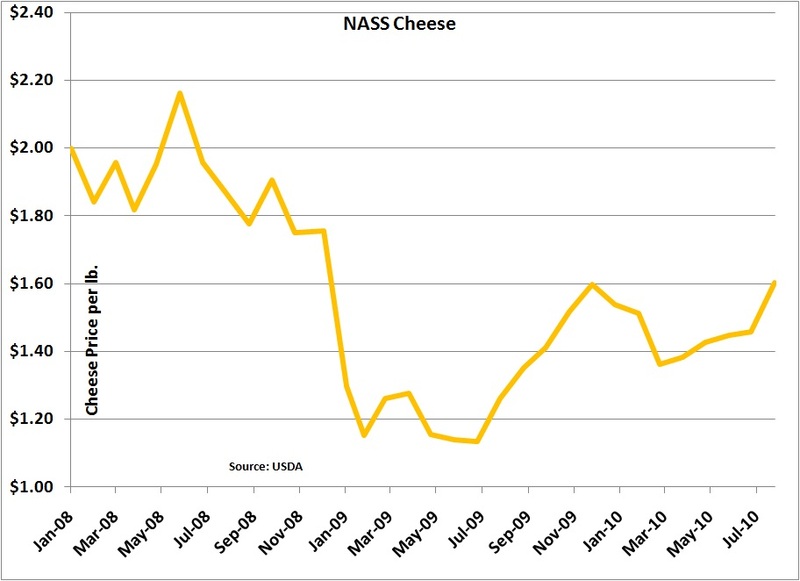 It's a little unusual for cheese prices to have increased as much as they have while inventories remain high. To sustain the higher cheese prices, inventories must decrease. 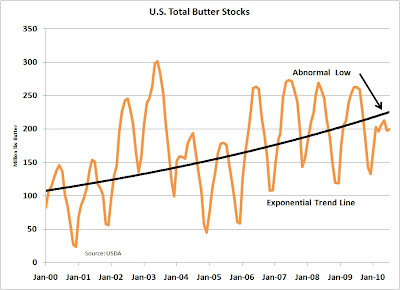 Butter inventories remain low, which is characteristic of the high market prices being seen currently. It's good to see the prices increased in August, however, until cheese inventories begin to be depleted, there is risk to a continuation of the stronger prices.